Coney fireworks to start on June 20 The first Friday night fireworks show of Coney Island's 2014 season is set for June 20, the eve of both the first day of summer and the Mermaid Parade. Sponsored by the Alliance for Coney Island, this free weekly event continues on Fridays through August 27. Friday night fireworks start at 9:30pm and are shot off from the beach. 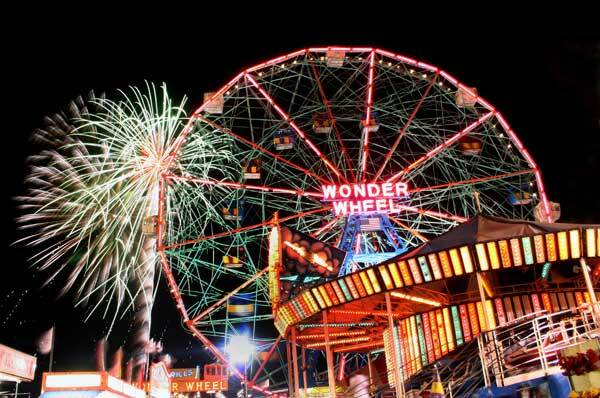 Best viewing is on the Boardwalk from West 10th to West 12th Streets or from the Wonder Wheel. Another popular viewing spot, Steeplechase Pier, reopened in October after being rebuilt post-Sandy. The Brooklyn Cyclones also have fireworks inside MCU Park on the following six Saturdays after their home games as well four other days, including the team's Opening Day, Saturday, June 14th, and June 16 and June 17. This year every Saturday night fireworks show will have a special musical theme. Fireworks at MCU Park start when the game is over, so the time varies and is sometimes later than 9:30. Since the Brooklyn Cyclones' Fireworks are shot from inside their park, best viewing is within and close to the stadium, which is between W 16th and 19th Streets. Sunday, August 31 – vs. Staten Island Yankees – Fan Appreciation Day -Post-Game Fireworks When the weather is iffy on a day when fireworks are scheduled, or if the show is delayed, check the Coney Island tweeters on Coney Island Fun's list for updates. Thanks to People's Playground photographer Jim McDonnell for his splendid photo of one of last summer's fireworks shows. Brooklyn to be part of 'Start Up NY' \Brooklyn will be home to one of a dozen new businesses coming to the state as part of the "Start Up NY" program. Gov. Cuomo announced the first round of companies on Wednesday, June 4, including one located near the SUNY Downstate Medical Center. The program waives taxes for 10 years for companies located on or near college campuses. Five CUNY campuses are participating, and businesses will soon open at Cornell, the University of Buffalo, the Rochester Institute of Technology, and other campuses around the state.They include companies working in biotechnology, advanced manufacturing and software development.